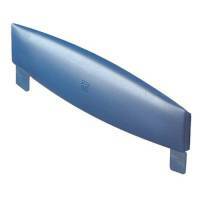 CEP Ice Blue Letter Tray Risers (Pack of 2) 140 ICE Blue Pack of 1 CEP Ice Blue Letter Tray Risers 140 ICE BLUE. 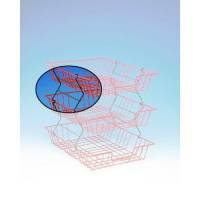 The blue risers create up to 80mm extra space between trays for easy document retrieval. Pack of 2. 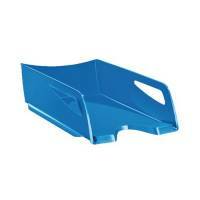 CEP Ice Blue Letter Tray 147/2I Blue Pack of 1 CEP Ice Blue letter tray 147/2i. Mirror finish transparent tray with a hint of Blue. 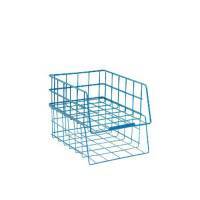 Trays stack vertically or staggered. Anti-skid pads prevent marks on your desk. Capacity: 500 sheets. Dimensions: W270 x D370 x H61mm. 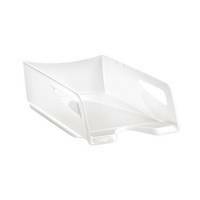 CEP Pro Gloss White Letter Tray 200GWHITE Pack of 1 CEP Pro Gloss Letter Tray White 200G. Will hold documents up to 240 x 320mm in size. Trays can be easily stacked. Features a cutaway raised section for ease of document retrieval. 100 percent recyclable. 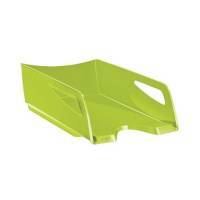 CEP Pro Gloss Green Letter Tray 200GGREEN Pack of 1 CEP Pro Gloss Letter Tray Green 200G. Will hold documents up to 240 x 320mm in size. 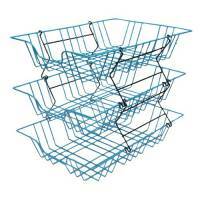 Trays can be easily stacked. Features a cutaway raised section for ease of document retrieval. 100 percent recyclable. 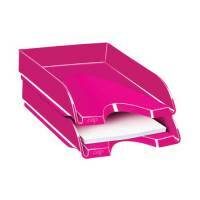 CEP Pro Gloss Pink Letter Tray 200GPINK Pack of 1 CEP Pro Gloss Letter Tray Pink 200G. 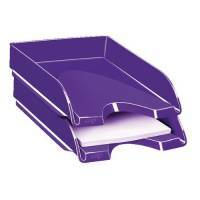 Will hold documents up to 240 x 320mm in size. Trays can be easily stacked. Features a cutaway raised section for ease of document retrieval. 100 percent recyclable. CEP Pro Gloss Purple Letter Tray 200GPURPLE Pack of 1 CEP Pro Gloss Letter Tray Purple 200G. 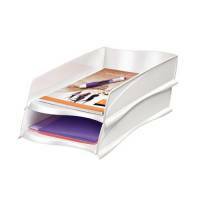 Includes an internal divider to securely section your writing instruments for quick easy access. Moulded in highly robust material. 100 percent recyclable. W74 x D74 x H95mm. 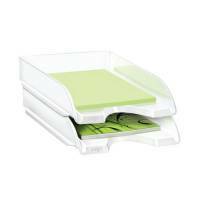 CEP Ellypse Xtra Strong White Letter Tray 1003000021 Pack of 1 CEP Ellypse Xtra Strong Letter Tray White 1003000021. S shaped design for easy retrieval. Recyclable shock resistant polystyrene. Can be stacked in stepped formation. W275 x D380 x H82mm. CEP Ellypse Xtra Strong Taupe Letter Tray 1003000201 Pack of 1 CEP Ellypse Xtra Strong Letter Tray Taupe 1003000201. S shaped design for easy retrieval. Recyclable shock resistant polystyrene. Can be stacked in stepped formation. W275 x D380 x H82mm. 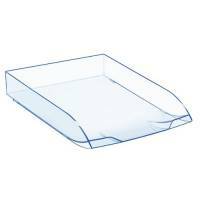 CEP Pro Gloss Blue Letter Tray 200GBLUE Pack of 1 CEP Pro Gloss Letter Tray Blue 200G Will hold documents up to 24 x 32cm in size. Stackable. 100 percent recyclable. W257 x D348 x H66mm. 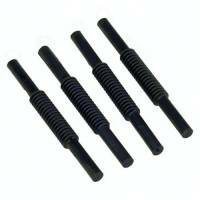 Wire Filing Tray Risers Black 777 (Pack of 2) Pack of 1 Black stove enamelled risers for stacking letter and filing trays. Shown complete with letter trays. A4 Blue Coated Wire Filing Tray 999BL Pack of 1 Letter tray for desk use. Lightweight plastic-coated wire construction. Front opening for easier access. Optional spacers for stacking available. For A4 documents. Blue. 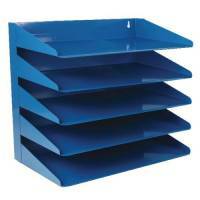 Avery Steel Letter Rack 5 Tier Blue 605 Pack of 1 5-tier sturdy steel letter rack. Can stand on desk or be wall-mounted. W380 x D230 x H335mm. Blue. 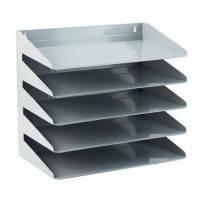 Avery Steel Letter Rack 5 Tier Grey 605 Pack of 1 5-tier sturdy steel letter rack. Can stand on desk or be wall-mounted. W380 x D230 x H335mm. Grey. 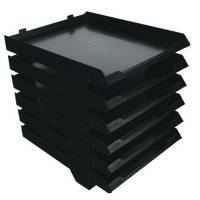 Avery Letter Risers 75mm Plastic Black (Pack of 4) 403 Pack of 1 Black moulded plastic letter tray risers. Set 4. 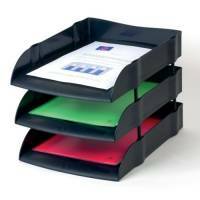 Avery Letter Tray Black 44CHAR Pack of 1 Suitable for both A4 and foolscap paper and files. Risers and Connectors sold separately. Avery 6 Tier Paperstack Black 5336BLK Pack of 1 "Highly functional, six-tier desktop stack for convenient holding or collating of A4 papers. Stylish polystyrene trays are self-stacking. Base tray has anti-skid, protective feet. Raised lip of tray front increases ease of access to tray contents. Black." 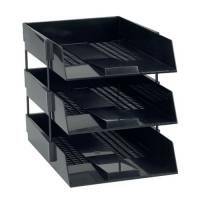 Avery Wide Entry Letter Tray Black W44BLK Pack of 1 Wide entry letter tray for use where forward space on desk or shelves is restricted. W367xD254xH63mm. Colour - Black. 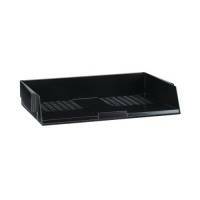 Avery DTR Eco Letter Tray Black DR100BLK Pack of 1 Avery Desktop Letter Tray. 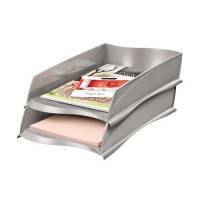 Angled base for easy retrieval of papers. Colour - Black.